By default the local default printer will be used to print till slips (receipts and other documents/forms). So all that is needed is that the printer is properly installed and that the printer is selected as the default printer. It is also possible to allocate specific printers for specific forms. See POS Printers. To set your printer as the default printer, go to your Windows Control Panel > Printers and Devices, right click on the POS printer and select 'Set as Default'. If the printer does not want to print, print a test page from Wordpad. If the printer does not print the test page, it means that there is a problem with your printer that you will need to sort out first (you might need to install the correct printer driver or contact the supplier). In ROBOTILL Retail or Restaurant, click on 'Reprint Last Slip'. Go to Manager > Setup > General Configuration. In the General Settings tab, un-check 'Don't print slips by default'. Click on Update General Settings and restart your POS module (close and open Retail and/or Restaurant). 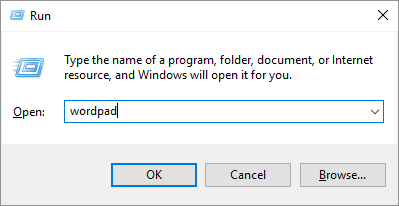 Right click on the Windows Start button and click on Run. Type in Wordpad and press Enter. Wordpad will open. Type 'Test' in wordpad and select File > Print > Quick Print. If the test page does not print on your POS printer, it means you did not select the POS printer as your default printer. 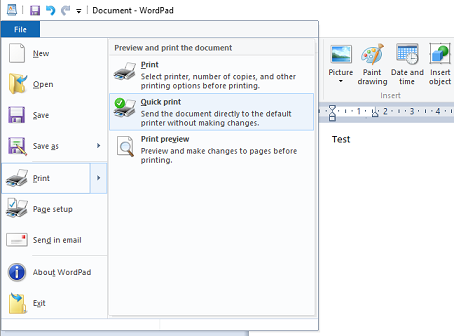 See the steps in the beginning of this page on how to set the printer as your default. If the test page didn't print, the problem is with your printer or printer setup and you will need to contact the supplier for support. If the test page does print, but it is not printing in ROBOTILL, check that you are using the correct printer for the selected form. See POS Printers. Also make sure that the proper printer driver is installed and not a 'text only generic printer driver'. ROBOTILL also prints graphics and logos so a text only driver will not work.